WASHINGTON (AP) — President Donald Trump’s prospects for brokering the Mideast peace “deal of the century” plunged ever deeper as the U.S. Embassy in Jerusalem opened amid bloodshed in Gaza. The day fueled global concern that U.S. policies are tipping the broader Middle East into deeper, intractable conflict. At the same time, Trump is winning international support for his efforts to strike a deal with nuclear-armed North Korea. But his contentious decisions in the Middle East are roiling a region where U.S. administrations have traditionally sought perhaps their biggest diplomatic prize: an elusive peace agreement between Israel and the Palestinians. The embassy move, which Trump hailed a “great day” for Israel even as dozens of Palestinians were killed in Gaza, damaged Washington’s stature as a mediator between those parties. And it’s but the latest in a series of U.S. decisions that may have set off a domino effect of unpredictable consequences. “Traditionally we’ve tried to play a role of fireman in the Middle East. Now we’re playing the role of arsonist,” said Ilan Goldenberg, a former State Department and Pentagon official who runs the Mideast program at the Center for a New American Security. Trump’s withdrawal last week from the Iran nuclear deal, against the protestations of European allies, appears to have emboldened both Israel and Iran to move more forcefully toward full-on confrontation. In Syria, Trump’s eagerness to pull out U.S. troops as soon as the Islamic State group is defeated has forced a reckoning by Iran’s enemies about the possibility that Tehran will fill the void. Dan Shapiro, a former U.S. ambassador to Israel, said Washington is not responsible for the fact that Iran acts as “the major source of tension and instability in the region.” But he said the question is whether Trump’s administration, having pulled out of the nuclear deal, has a strategy to deal with Iran in its absence. 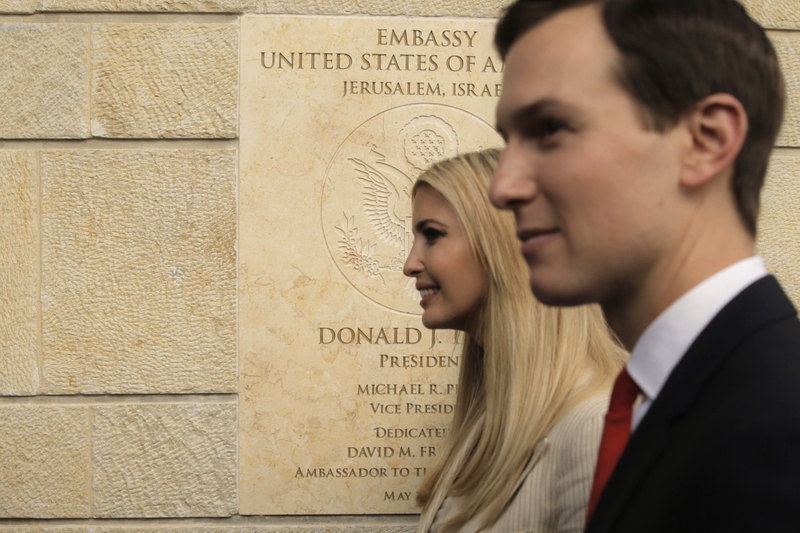 Left unsaid was the fact that Kushner’s team has had to shelve Trump’s long-awaited peace plan indefinitely amid the Palestinian uproar over the embassy move, several U.S. officials have said. Since Trump in December recognized Jerusalem as Israel’s capital and announced the embassy would move, the Palestinians have effectively cut off all ties with the White House, a diplomatic chill that augurs poorly for the possibility that Trump can now introduce a plan the Palestinians would accept or deem fair. The White House response to the deaths of dozens of Palestinians at the hands of Israeli troops on Monday during mass protests on the Israel-Gaza border won’t help. The administration called the deaths “tragic” but said they were the fault of Hamas, which controls Gaza and has fomented the protests. It voiced strong support for Israel’s right to self-defense. The renewed Gaza violence has created the unsettling but real possibility that Israel — far from enjoying a new era of peace with its neighbors — could soon find itself fighting wars on two fronts: with the Hamas militants who run the coastal Gaza Strip, and with Iranian troops and Iran-backed Hezbollah fighters in Syria. Already, fallout from the embassy opening has spread far beyond Jerusalem, illustrating how in the delicate Mideast, one point of conflict often begets another. Jordan’s King Abdullah II took to Twitter to say the embassy move would have “dangerous implications” for security and “provoke Muslims and Christians.” Thousands gathered in Turkey to protest the move. Several nations said they were pulling their ambassadors from Israel to protest the deaths in Gaza. And Erekat announced Monday that Palestinian leadership in the West Bank had decided to file a war crimes complaint against Israel with the International Criminal Court. “I cannot see the U.S. being an honest broker, whatsoever, as far as the Palestinian public is concerned,” he added. Associated Press writer Karin Laub in Amman, Jordan, contributed to this report.